Steps to Developing a Five-Year Pavement Management Plan - Benchmark Inc. Managing your pavement assets is the same whether you manage one site or multiple sites. The steps involved are the same–they just differ in size and scope. Asphalt and concrete pavements are a large part of your site asset portfolio, and are probably worth more than you expect. The average asphalt pavement system replacement cost can also be many times more than the initial installation cost. Pavement replacement can also be very time consuming, causing areas of your facility to be out of service – which can impact operations and revenue. It is important to protect these assets just as you would maintain your buildings. A plan or program approach where each pavement or site is “touched” every three to five years is desirable. This is a good time span since a typical pavement that is properly designed, installed, and maintained will weather three to five years without any major defects developing under most traffic and climatic conditions. The first step in creating a five-year pavement management plan is to inspect and evaluate the existing pavements. The pavements should be rated and prioritized by usage and condition, and any preventive maintenance work that needs to be completed should be documented. A pavement rating system needs to be implemented in order to develop a means for prioritization. This pavement rating system should take into account pavement distresses, drainage and other conditions that have an impact to its serviceable life. Be sure to check not only the condition of the pavements and walks, but also the drainage structures, curbs, car stops, signage, and pavement markings as these are all integral parts of the pavement system. Also note, any safety issues that need immediate attention and scheduled repairs should be identified for these areas. ADA accessible parking and routes to the building entrances should be of high priority. The evaluation process is essentially an inventory of all pavement distresses and associated conditions that utilize a systematic approach for applying a pavement rating. Once your site or sites have been evaluated and a rating system applied, the pavements should be divided into categories by condition, which is generally grouping them by how they are to be managed. See illustration below. The first group should include pavements that are in good, very good, or excellent condition overall. These pavements may require minor repairs along with preventive maintenance, but won’t need any major work completed within the next five years. The second group includes pavements that are in fair or moderate condition. These pavements may require a greater number of repairs, but still have useful life remaining. Options such as an asphalt overlay or resurfacing could be approaches to extend the life of the existing pavement structure before a more costly reconstruction is needed. The third group includes pavements that are in poor, failing or failed condition. These pavements may no longer be serviceable and are likely past the point where repairs or an overlay would be a cost-effective management technique. A form of pavement reconstruction would be the only alternative for restoring serviceability. 1. The deterioration rate of a pavement increases rapidly with age. 2. The renovation costs of a pavement increases rapidly in the final portion of a pavement’s life. Pavement Condition Index (PCI) is the most common tool of a pavement rating system to apply a condition rating that allows for prioritization and ability to categorize conditions. Preventive Maintenance: Your first inclination may be to spend money on the third group, or your worst pavements. This is not always the best approach. Your maintenance money is actually most wisely spent in the first portion of a pavement’s life because once the pavement falls below fair condition, the majority of its useful service life is over. Costs to replace a pavement, whose useful life is over, are greatly increased compared to utilizing preventive maintenance measures or pavement rehabilitation options in lieu of reconstruction. The best way to increase the overall condition of pavements, at any site in the long run, is to protect the pavements in fair or average condition. The first year of budgeting should focus on preventive maintenance repairs such as pavement patching, drainage structure repairs, concrete jointsealing, and asphalt cracksealing. In addition to preventive maintenance repairs being done in the first year, funds should be allocated in the third or fifth year of the program for preventive maintenance of these pavements as well. These repairs should be done in the first two groups of pavements. Only critical repairs to the pavements in the worst condition should be completed to address safety issues or any other repairs necessary to keep the pavement serviceable while planning and budgeting for reconstruction/replacement. Overlays & Resurfacing: After preventive maintenance repairs have been performed, the next items to budget for are structural overlays or asphalt resurfacing projects. Overlays and resurfacing protect the underlying pavement structure and improve or restore structural strength. These can extend a pavement’s life span significantly, and may be able to be performed more than once in a pavement’s life cycle (if conditions allow). Timing for scheduling an asphalt overlay or resurfacing can be crucial. The window of opportunity can be lost if declining conditions don’t allow for building upon and enhancing the structural integrity of the pavement as it deteriorates towards a larger degree of failure. Pavements in fair condition may require a high level of monitoring and a conservative approach to planning for an asphalt overlay. Reconstructions: Once you have all the overlays and resurfacing projects aligned in the five-year plan, you can prioritize and schedule the third group-the reconstruction projects. Most pavements in poor condition are not good candidates for a structural overlay or resurfacing. (Note: Concrete pavements don’t allow for interim measures such as overlays.) Poor condition pavements may be candidates to remain in serviceable condition with minor repairs each year. The cost to reconstruct these pavements may not change significantly from year to year if there is a means to repair them along the way. Reconstruction pricing varies greatly, and much depends on the underlying conditions of the subgrade and other factors such as climate and traffic. 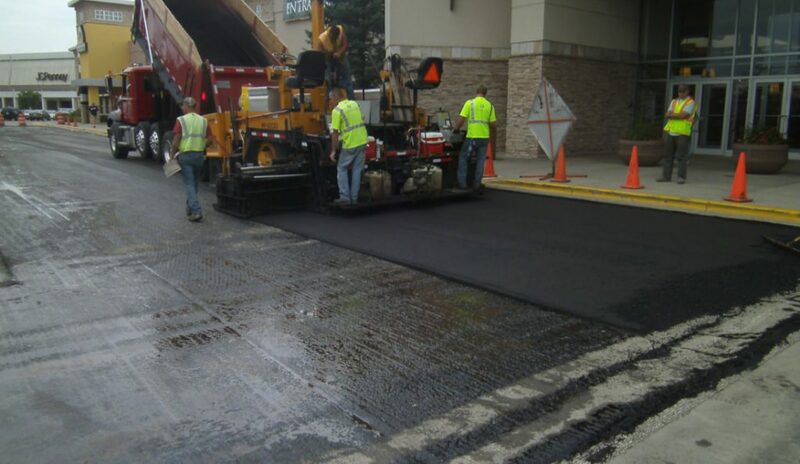 An asphalt overlay is utilized to extend the life of the existing pavement structure. It is good practice to review your pavements yearly to see if any safety hazards have developed and to determine whether any issues are taking place that may have an impact on the long-term plan. A re-evaluation conducted every three years is practical, but should be adjusted based upon changing conditions that might be taking place. As with the initial evaluation, you will want to document any repairs and maintenance items that should be done. Update the rating of each pavement and group them into the three condition categories used for maintenance, overlay, and reconstruction considerations. Once you do this, follow the same guidelines for setting budgets for the following five years. It is a good idea to document the details of any work that was completed in the last five years and keep copies of the construction documents for future reference. Conclusion Following these steps to develop a five-year plan is a good start to managing your asphalt and concrete pavements. 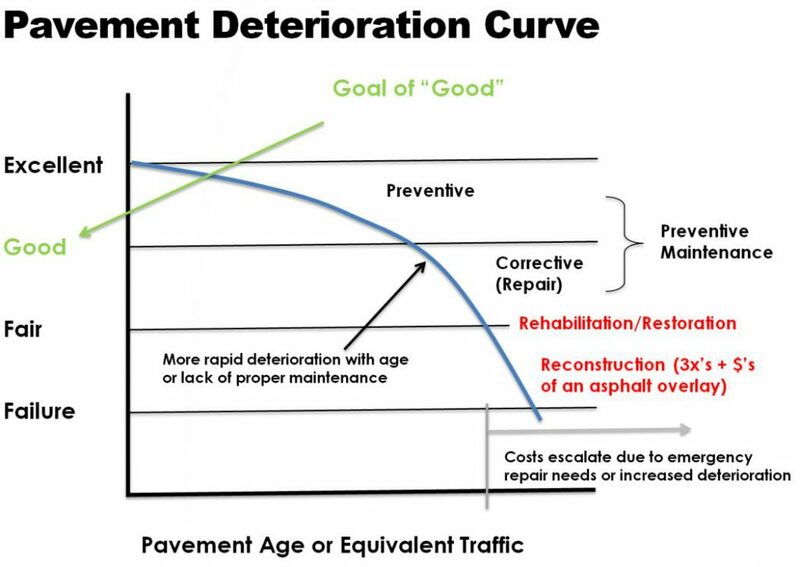 A good program will achieve the goal of protecting newer pavements through properly timed preventive maintenance, while updating older or deteriorated pavements to assure serviceability and safety. Keeping the program current, effective, and flexible, is accomplished by conducting interim evaluations to adjust the pavement rating conditions and forecasted five-year plans. By developing a five-year management plan, the overall condition of your pavements will improve and your yearly costs will become more predictable and manageable. Most of all, it provides a path to the best use of your pavement expenditures.